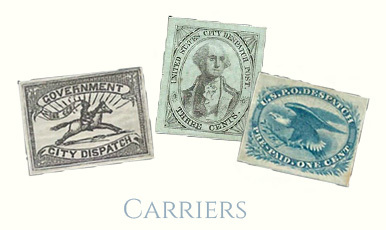 The Carriers and Locals Society offers selections of the Farrell Collection of US Local Post, Carriers, Independent Mails and Express Stamps, Including Fakes and Forgeries for viewing and download. 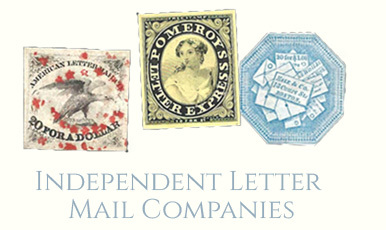 These are selections of a privately held stamp collection and are not intended as a completed catalogue of stamps and forgeries that exists. 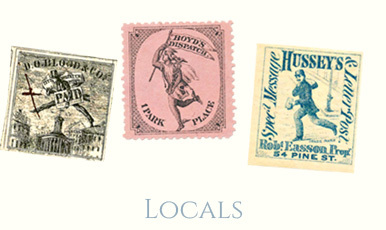 The Farrell Collection’s goal is to share a collection of stamps and philatelic material for collectors to use as reference. Each section includes a brief description of the post and some examples of the stamps and their forgeries. It is intended to provide an introduction and some inspiration to beginning collectors; and a convenient resource for experienced collectors or dealers seeking reference images of specific stamps or forgeries. Unless otherwise noted, stamps are identified by their Scott Catalogue numbers and forgeries are identified by their Lyons Identifier type. In addition, some examples include additional information such as plate position or Taylor form. The information and identification within these selections is the individual work of the Farrell Collection and may not reflect the opinions of the Carriers and Locals Society as a whole. It is always recommended to consult multiple sources for additional information or opinions. Local post company descriptions are based on information available at the time of writing. The Farrell Collection welcomes feedback, corrections, or other information that can improve the collection. Comments and inquires can be addressed to [casey.white@conceptsindustrial.com]. Taylor form identifications within this collection are listed using a combination of the Springer Forms and the Boussery Forms, the latter of which were created specifically for the Farrell Collection. The following four reference albums represent almost three years of work reconstructing these forms. Additional information on Taylor and these forms can be found here. This is a segment of the forgeries presentation from the 2018 APS StampShow. The Farrell Collection is an ongoing project. Additional selections will be made available on the Penny Post website periodically. Selections are uploaded based on completion or interest. Scott numbers in parenthesis under listed forgeries represent approximately what stamp the forgery is attempting to imitate. Colors listed for stamps and forgeries are the opinions of the Farrell Collection based on viewing physical copies of the pieces under consistent lighting. Colors in the .pdfs may be slightly inaccurate due to manipulations from the scanning process, computer monitor settings, or (in event that the files are printed for offline viewing) the printing process. 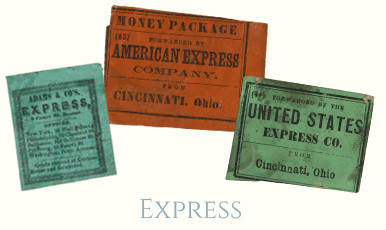 Descriptions in the Farrell Collection were written based on personal research and sources including, but not limited to: Articles in The Penny Post; the Scott Catalogue; Patton’s The Private Local Post of the United States; Mosher’s Catalog of Private Express Labels and Stamps; Springer's Handbook of North American Cinderella Stamps; Lyons’ Identifier for Carriers, Locals, Fakes Forgeries and Bogus Posts of the United States; The Eastern Independent Mail Company Study Group's Eastern Independent Mail Companies and Express Mail Companies 1840-1845; Elliot Perry's Pat Paragraphs; James N. Drummond's Catalog of Philatelic Miscellany and College and School Stamps; and the notes of George Sloane and Gordon Stimmell.